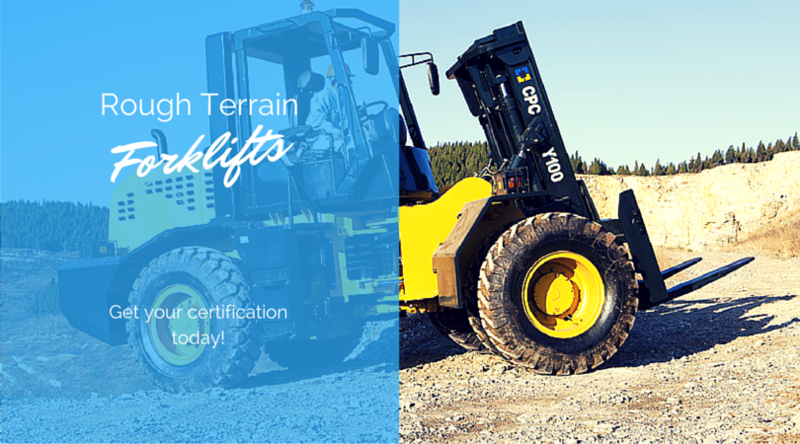 Rough Terrain Forklift Certification, Get Training & Certified Now! Rough terrain forklifts are used to lift heavy materials over a surface that may be unstable and difficult to navigate. They share many characteristics of a regular forklift but come with their own unique uses and operational functions that are taught in rough terrain forklift training. CertifyMe.net offers rough terrain forklift certification for anyone that is required to use this type of lift. If you need to become OSHA certified with a rough terrain forklift, or you’d like to expand your own knowledge base and make yourself a better job candidate, we have the resources and training you need. According to OSHA, rough terrain forklifts are classified as class 7 forklifts, and include three primary types: vertical mast rough terrain forklifts, variable reach rough terrain forklifts, and truck or trailer mounted rough terrain forklifts. The program with CertifyMe.net covers electric and internal combustion engine trucks and teaches about sit down rider forklifts, straight mast forklifts, extended reach forklifts, telescopic forklifts, extended boom forklifts, and straight mast rough terrain forklifts. With our program, workers will learn everything they need to know to become expert rough terrain forklift operators in the most efficient manner available with our rough terrain forklift certification. These forklifts are used for many heavy-duty outdoor applications, including construction sites, docks, and elsewhere. CertifyMe.net can help you become a safer rough terrain forklift operator – with our training classes, it’s easier than you think! Rough terrain forklifts require trained operators to handle them, or their use can lead to serious accidents. Although rough terrain forklifts are more capable of handling challenging situations, it does not mean workers are immune to injuries and fatalities caused by accidents. In fact, the majority of rough terrain forklift accidents are caused by operator error, which rollovers, tip overs, and collisions. Rough terrain forklift certification with CertifyMe.net teaches workers how to avoid these hazards and navigate through various situations to prevent accidents. Our training also stresses the importance of terrain, so we show you certain hazards to be aware of. It is not only crucial to the health and safety of a workplace to have trained operators, however. It is also required by OSHA who has recently set stricter laws for employers and workplaces in regards to proper employee training. Neglecting to train workers now has serious financial and legal implications. Don’t take any chances with your all terrain forklift safety training. Call CertifyMe.net today and become OSHA compliant! Average completion time of only one hour! Our rough terrain forklift certification program is designed for workers, by industry workers. We know what it takes to educate operators on all the important information they need to know on the job, and what qualities a training course should have to be convenient and effective for students. We know you all have busy schedules and that it’s sometimes not possible to travel to an offsite training facility and spend days completing an expensive rough terrain forklift certification. All of these benefits make our training program the most affordable, convenient, and comprehensive rough terrain forklift certification available. If you want to upgrade careers or start a brand new one, rough terrain forklift certification can get you there. After completing our online program you’ll qualify for construction jobs on a wide variety of worksites. Rough terrain forklifts are built for accessing natural, uneven terrain and rocky construction sites, and are frequently used on both residential and commercial builds. No matter where you’d like to work, you can find your new career with a specialized rough terrain forklift certification. What Does Rough Terrain Forklift Training Teach? To offer the most well-rounded all-terrain forklift training program available, our course teaches all the different types of trucks that fall within the all terrain forklift category. We teach electric and internal combustion engine tractors, which includes rough terrain forklift trucks, straight mast forklift, extended reach trucks, telescopic forklifts, extended boom trucks, and straight-mast rough terrain forklifts. All-terrain forklift training will provide you with the comprehensive education you need, as an operator, to use rough terrain forklifts to the best of your abilities and protect your life by preventing accidents. If you’re an employer of forklift operators, then choosing the right training program is just as important because it’s what will keep your workplace safe and out of the way of fines and legalities. With information for extended reach, telescopic, and straight mast forklift training, our online course will teach the specific type of forklift you use in your workplace. For the best training program available that will not only prepare your employees to operate all types of all terrain forklifts safely but also ensure you’re compliant with industry standards, you need an OSHA-compliant course. According to OSHA, all forklift operators must receive training that consists of written instruction, practical training, a rough terrain forklift test, and an evaluation. It must cover both rough terrain forklift truck related and workplace-related topics, and led by a qualified Trainer. The course with CertifyMe.net meets all of these requirements and ensures you and your employees are always OSHA-compliant, with free three-year renewals for life. How Do I Complete My Rough Terrain Forklift Training? All you have to do to get yourself certified to operate rough terrain forklifts is to go to our website, create an account, and begin the lessons. It’s that easy! You will learn about rough terrain forklifts, as well as the other types including all-terrain forklifts, telescopic forklifts, construction forklifts, and snorkel forklifts. We leave no stone unturned because we want to make sure our students leave our training feeling completely confident operating all types of forklifts. Do you want to prevent accidents and be a valuable asset to your employer? Then complete your rough terrain forklift training with CertifyMe.net today! For questions about our rough terrain forklift certification, call CertifyMe.net at 1-888-699-4800. We look forward to helping you today! Thank you for considering CertifyMe.net for your all terrain forklift safety training needs.